'The speed of execution is picking up,' Union Minister Jayant Sinha tells Arindam Majumder and Nivedita Mookerji. Our guest had ruled out five-star hotels for this meeting, so we brainstormed on other restaurants and settled for The Potbelly at Bihar Niwas in the diplomatic enclave of Chanakyapuri, New Delhi. The rather quiet place with barely 15 tables, filling up at a lazy pace, seems ideal for the afternoon. We reach early to ensure things are in place and opt for a high table, literally. The seating arrangement at the restaurant is such that three tables with sofas are placed about six steps higher than the rest. But the guest, who deals with the skies, is not quite impressed by the height we had carefully selected for him. So we shift down to a corner table, much smaller but friendlier and closer to the greens just outside the large windows. We check the menu while sipping lemonade and are fascinated by its range of Bihari starters such as saboodana basket, keema aloo chop and phish phinger. But the guest, Minister of State for Civil Aviation Jayant Sinha, skips both the drinks and the starters, asking for plain water instead. "I am very fond of Indian home-cooked food, which is why this place. It captures the home-cooked Bihari cuisine quite well," says the first-time parliamentarian from Hazaribagh, Jharkhand, who calls himself a foodie. We start the conversation without wasting time, assuming the minister would be in a hurry to leave for the next appointment. But the guest is in a mood to talk over a leisurely lunch, though extremely guarded when on the subject of Air India disinvestment. Sinha's journey from Hazaribagh to Harvard via IIT-Delhi, investment fund management to politics, finance to the aviation ministry -- we cover the entire gamut before we get around to ordering the main course. There are many local recipes on offer, such as Madhubani thali, Ranchi ki pulao and litti chokha. We pick tehri, a special pulao served with aubergine mash, pickle and raita, and a Madhubani thali. The guest smiles and says, "I will have the tehri too." We return to the topic of his transition from an I-banking professional to politics. "The transition has been rewarding, not difficult. I am privileged to serve this government," is how he describes the two tracks of life. "Public life has given me many fulfilling opportunities. The ability to conceptualise things, see them getting done -- which directly have an impact on the lives of people -- that is very satisfactory," he says. He points out that he has been associated with politics since much earlier, when his father and a former minister, Yashwant Sinha, fought the elections. He recalls how he had taken a sabbatical for three months in 2009 to campaign for Sinha senior. He says he grew up as the son of a civil servant rather than that of a politician. We ask the uncomfortable question about his father's political distancing from the Bharatiya Janata Party and are surprised by his candid answer. "We are a close-knit family, but we keep our public and personal lives separate. There is a clear distinction between the two..."
The food arrives and we get into a light conversation about his reading, taste in food and travelling. As we dig into our plates of tehri, Sinha tells us he manages to read for about two-and-a-half hours every day. In addition, there is plenty of social media through the day, like many other ministers in the Narendra D Modi government. As for cuisine, he likes all kinds as he travels around the world, but mentions Chinese as a favourite. There aren't many vacations, it appears, though he keeps us guessing on the number he has had since becoming a minister. Whether one is a professional or one is in public life has a huge bearing on one's holidays, he points out. "You can plan a holiday as a professional, but it is tough when you are in public life," he says. As we savour our tehri, the minister tells us how his lunch is usually a very quick affair in the middle of a series of meetings. "When I am in Delhi, I just open my tiffin box, have two rotis and rush." We go back to Air India: Is it taking up most of his time? Not as much as safety and security. Then he gives a precise break-up -- his previous stints at McKinsey, Courage Capital and Omidyar Network coming in handy! He spends 50 per cent of his time on ministry work, 40 per cent on constituency work and 10 per cent on party work. The Air India divestment is important and is on track, he says. But who are the likely bidders as many hopefuls are apprehensive about investing in Air India as long as there is government control? He cites confidentiality while refusing to divulge any information that is not already in the public domain. "Let us see," he says. Sinha then turns to a subject close to his heart -- Udaan, which according to him, "is sufficiently attractive". Under Sinha, the civil aviation ministry has brought in small but meaningful reforms like conceptualising a policy that aims to bring air connectivity to India's hinterlands, digitisation of the check-in process and removal of baggage stamping. "At the finance ministry, I had the opportunity to work on the national infrastructure fund, the higher education financing agency, the Bankruptcy Bill. Here in civil aviation, small things like bringing wifi on board to improving how airlines treat their passengers, we want to change the quality of flying." "We get to work on all of that. That's an extraordinary privilege," he says. Trying to assess the mood of the government, we ask if the countdown to the 2019 general elections has begun. "We are making a transition from governance to campaign mode. The speed of execution is picking up." What is it like working with Prime Minister Narendra D Modi? Does he operate like the quintessential CEO? "Like any great leader, he demands performance," Sinha replies. The main course is getting over and we start considering dessert. The apple cinnamon cake sounds like a good idea, but the minister doesn't seem to have a sweet tooth. He wants a cappuccino, but the restaurant disappoints. Sinha asks for the next best hot beverage -- masala chai. We say, "Yes minister." While the restaurant staff disappear to service the order, we ask the former minister of state for finance about the Punjab National Bank-Nirav Modi scam spanning the United Progressive Alliance and National Democratic Alliance regimes. He argues in favour of the NDA. 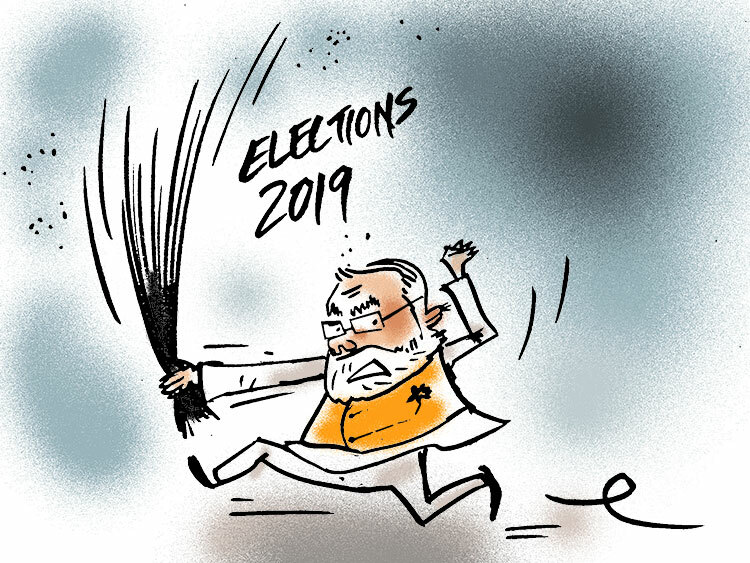 "Pradhan mantri jab jhaadu chalate hain, UPA-ka scam bahar nikalta hain (When the prime minister wields the broom, the UPA's scams tumble out)." He explains: "Systematic cleaning up of the entire system is happening in front of your eyes; that is why all the dirt is coming out." He adds: "We have squeezed black economy from all sides." The tea arrives and Sinha pours it for us. "As they say, I will play the mother," he jokes. We ask him what his typical day looks like. Boring, he says. Yoga in the morning, followed by public meetings, ministry work and reading. "On an average, I read two books a week and multiple newspapers and magazines. I take my reading very seriously," he says. He just finished Thomas Friedman's Thank You For Being Late and hopes to start on Ray Dalio's Principles. "I am a big fan of technology. From online shopping to online entertainment, I take all the benefits that technology offers," he says. Sinha is currently watching the second season of the Benedict Cumberbatch starrer Sherlock on Netflix. He hasn't been to a theatre for a long time. It is time to leave. Last question, we are told. What other role would he like to play as part of this government? "From my previous experience as a management professional, I learnt not to have strong likes and dislikes." Why do Modi and his Mantris Mock Science? Think the unthinkable: Can Rahul be PM in 2019?